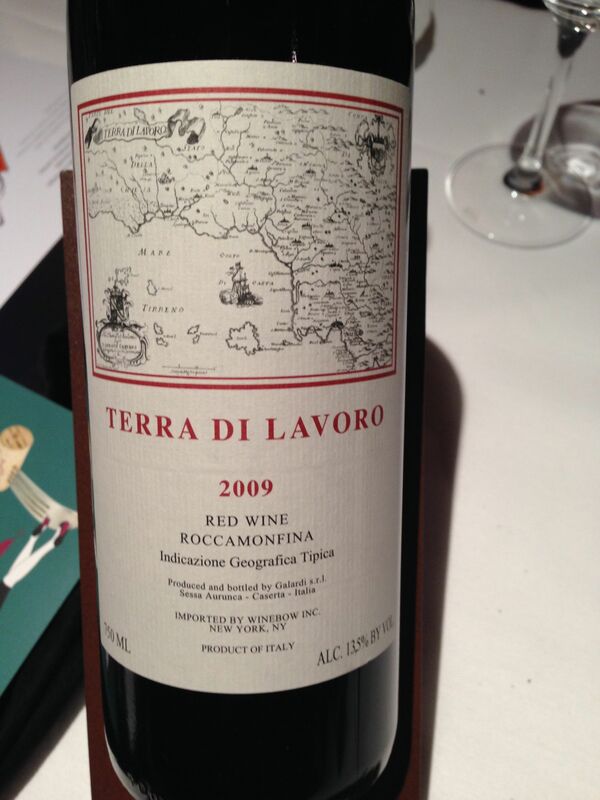 This week’s wine of the week is Terra di Lavoro from Campania. The wine is the only one that the Galardi family makes on its estate. The estate was created in 1991 by four cousins. The family hired Riccardo Cotarella and the first vintage was made in 1994, just 600 bottles of the wine were released. Now 32,000 bottles of the wine are produced. The winery is located on the slopes of the extinct volcano Roccamonfina in northwestern Campania. The name of the wine is actually a reflection of how difficult it is to work this land and grow grapes. The wine is made from a blend of indigenous varieties from Campania – Aglianico and Piedirosso. Aglianico does the lion’s share for the wine. Some 80% is Aglianico, with Piedirosso playing a supporting role. The vineyard lies at 1500 feet and is subjected to strong winds in both directions. Fermentation takes place in stainless steel before the wine ages in French barriques from Allier and Nevers for one year, after which time the wine spends an additional 10 months in the bottle before release. They use 70% new oak and 30% second passage. Wine Spectator. I had never heard of it before that event but have taken the opportunity to taste it again every chance I get. The most recent one was at an event held in March 2014 at Del Posto. The wine was just incredible. It had rich, spicy notes with black and red fruit aromas and flavors as well as floral overtones from the Piedirosso. It also had an herbacious, earthy quality with hints of tobacco and ripe, juicy tannins. I highly recommend this wine with a special meal. I tried the 2009 and the 2011 at the event and both were gems. The wine is imported by Winebow.